Oh crap. 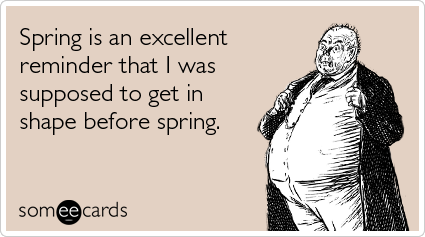 This card made me laugh out loud…Boy, it’s almost May and I am NO WHERE near in swimsuit shape. I’m not even in shorts and a tank top shape! After I had Anya, the weight seemed to melt off, only to come packing right back on a few short months later. I had been so excited to be back to me normal weight, only to rebound to 7 month pregnant heaviness. And I had a BIG baby. I am not in good shape. I resolved time and again to work out. I even had a few weeks of real attempts where I actually made it to the gym. Alas, it didn’t stick. Now, I am faced with a very early summer and I know I need to lose weight. I’m not very good at dieting or juice fasts or cleanses. I know I just need to get active. It’s a question of motivation. My dresses that are just thismuch too small. The shirts that just almost fit. All that stuff is finally starting to push me towards actually getting off my tush and doing some sort of exercise. I’m giving myself a challenge to fit into some more clothes and feel a little bit less self conscious by the end of May. I will commit to doing exercise 3 days a week, and a minimum of 30 minutes each of those days. Yeah, that’s not a tight deadline. Nor is the goal super lofty. But, I need to ease into this. Anyone feeling this way??? Got any good tips for me?? ?